Glass of wine in hand, relax at The Lodge, a new kind of country retreat in Royal Deeside, Aberdeenshire. 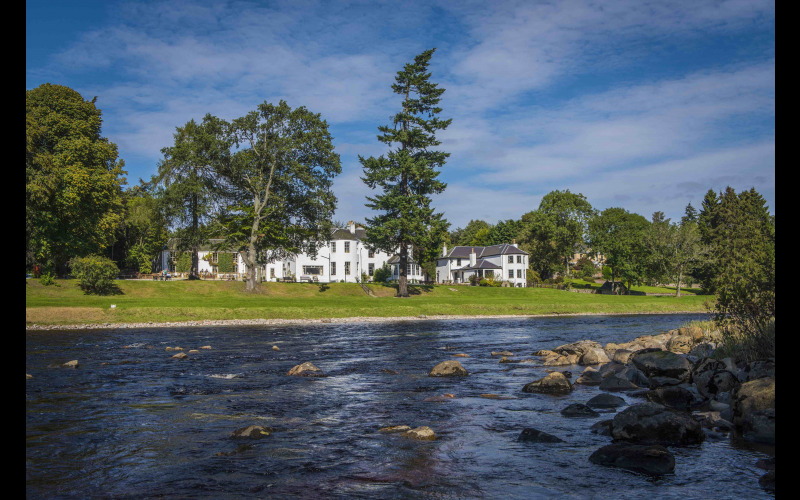 This back-to-nature 4-star boutique hotel is perched on the banks of the River Dee and was named has one of the best restaurant views in the UK by the Daily Mail. Located at the gateway to Royal Deeside, there’s plenty to see and do in the area. With fishing right on their doorstep, historic castles for the perfect photo opportunity, golf courses and stunning countryside walks. Enjoy a light lunch out on the terrace or a spot of afternoon tea before setting off on a road trip. Experience one of Scotland’s most spectacular driving routes, the North East 250. Head through the mountain passes of the Cairngorm National Park and up towards the prestigious distilleries of Speyside. Refuel after a day exploring, in their award-winning restaurant. Menus that change with the seasons are made using the finest of local produce. Rock up to their bar after dinner and find an array of whiskies, craft gins and local beers. At the end of the day, kick off your shoes and fall asleep in your contemporary, Top Notch bedroom with its gorgeous shiny bathroom.